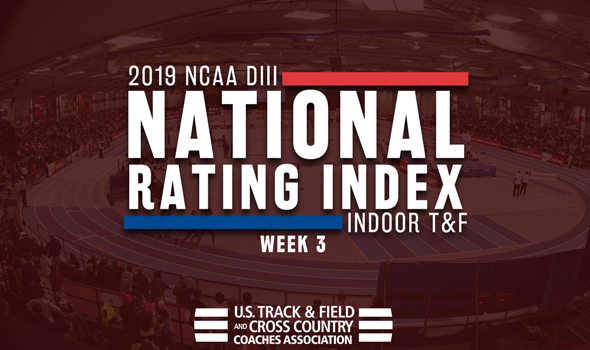 NEW ORLEANS – The NCAA Division III Men’s and Women’s Indoor Track & Field National Rating Index continues to evolve as the season progress. Only 12 of the 50 combined teams in the top-25s remained in place between Week 2 and Week 3, while there were several new additions to the respective top-15s. Remember: The 2019 NCAA Division III Indoor Track & Field Championships will take place between March 9-10 in Boston at the Reggie Lewis Track and Athletic Center. It’s still a two-horse race between North Central (Ill.) and UW-Oshkosh, but the latter closed the gap on the former between Week 2 and Week 3. Ryan Powers turned in a stellar effort this past weekend at the Red Hawk Invitational to pace the Titans. Powers clocked a time of 47.52 in the 400 to move up to No. 2 in the TFRI Individual Rankings. That was the main reason why UW-Oshkosh’s point total climbed nearly 26 points. Mount Union is ranked No. 3 this week after a steady rise. Last week it was the Purple Raiders’ 4×400 relay team that stood out, but this week both Lucas Cooper (shot put) and Evan Hershberger (high jump) improved their standing on the national scale to help their squad. UW-Platteville jumped eight spots from No. 16 to No. 8, which is its best ranking since the 2014 season. The Pioneers’ 4×400 relay team got the baton around in 3:16.14 and is now ranked No. 2 in the nation, while Cody Faust totaled 5045 points in the heptathlon this past weekend at the Wartburg Indoor Select to take over the No. 4 spot in the TFRI Individual Rankings. Other notable moves in the top-25 were turned in by Loras (No. 23 to No. 16), Wartburg (No. 25 to No. 18), Middlebury (No. 30 to No. 19), SUNY Cortland (No. 27 to No. 20) and Washington (Mo.) (No. 48 to No. 24). There was a lot of movement to be had in the top-25 this week as only five teams remained in the same spot as they were in Week 2, namely No. 1 Washington (Mo. ), No. 4 MIT and No. 9 SUNY Geneseo. Johns Hopkins and Williams swapped spots as the former is now ranked No. 2 and the latter is at No. 3. The Blue Jays and the Ephs are followed by the aforementioned Engineers and new No. 5 Loras. The Duhawks received a strong effort from Gabby Noland this past weekend at the Keck Invitational. Noland improved her time in the 60 to maintain a share of the national lead in that event and notched the nation’s fastest time in the 200 of 24.59. Both of those, coupled with the 4×400 relay team’s big afternoon (3:52.53 to move up to No. 2 nationally), moved Loras back into the top-5 for the first time since the preseason. New additions to the top-15 include Coast Guard and Augustana (Ill.), which jumped 19 spots and seven spots, respectively. The Bears come in ranked No. 12 following strong efforts from Kaitlyn Mooney in the 3000 and the DMR team two weeks ago, while the Vikings’ 4×400 relay team worked its way inside the top-8 nationally with its time of 3:57.18.